MANILA, Philippines - San Miguel’s no Holy Week break paid off as the Beermen clobbered Magnolia, 111-87 and took the PBA Philippine Cup Finals’ 2-1 series lead on Easter Sunday, April 1, 2018 at the Smart Araneta Coliseum. 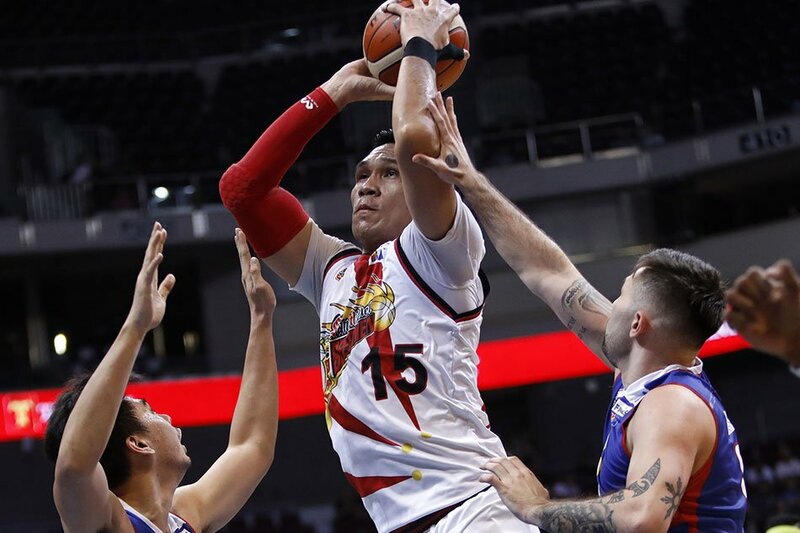 Right after game number 2, June Mar Fajardo and Arwind Santos disclosed that there will be no Holy Week break for them and they will continue to hold practices and prepare for the dangerous Magnolia Pambansang Manok who pushed the Beermen to their limit in game number 1. Chris Ross opened the books as he poured in quick 5 points together with Marcio Lassiter’s 8 markers in just couple of minutes after the opening tip off. SMB led Magnolia 13-7 and the latter immediately called for an untimely timeout to slow the Beermen down. Jio Jalalon and Mark Barroca tried to close the scoring gap but Marcio Lassiter kept it coming from the three point territory as a retaliation to Magnolia’s offensive efforts. Coach Chito Victolero was whistled for a technical foul for continuous complaining at the 1:08 mark. Coach Victolero clamored for an offensive foul on Matt Ganuelas-Rosser for illegally screening Rome Dela Rosa. At the end of the first 12 minutes, San Miguel led Magnolia by 7, 29-22. Aldrich Ramos found his rhythm at the latter part of the opener and carried on his shooting momentum at the start of the 2nd period. Ramos had already tallied 9 points with 11 more minutes to go at the 1st half. June Mar Fajardo who just jotted down 2 points in the first started to be comfortable under the rim with Kyle Pascual guarding him. PJ Simon on the other end of the floor drained basket after basket to keep SMB’s margin small. Magnolia tied it up at 43 with 3:42 left in the 2nd period after Paul Lee fired a long bomb. Before Lee’s triple, it was really Simon who closed the gap with 10 points in the second. Chris Ross got fouled by Rafi Reavis during the dying minutes of the 1st half. Ross however, split his foul shots and gave SMB a half-shot lead, 50-49 before both teams headed to the dugout for the halftime break. San Miguel welcomed Magnolia at the start of the 2nd half with a 6-0 scoring blitz to widen its margin anew. Chris Ross sniped from the outside to start the onslaught. June Mar Fajardo abruptly exploded after a low 1st half production and brought his team’s advantage up to double figures once again. Magnolia game 1 hero Ian Sangalang struggled again and was heavily guarded by June Mar Fajardo. Nevertheless, his team was able to cut the lead to just 3 under 3 minutes of the third. Paul Lee and Jio Jalalon provided spark for Magnolia to downsize the double-digit lead. “The Kraken” ended the penultimate period at the foul line and completed his charities for the 75-68 lead. Magnolia started the 4th period with Ian Sangalang in foul trouble. Sangalang had 12 more minutes to play and spare his last personal foul. Coach Leo Austria capitalized on Magnolia’s weakness in the middle and ordered his squad to attack the basket relentlessly to escalate the lead to a dozen. San Miguel began the final canto without June Mar Fajardo on the hardwood. Instead of losing their advantage, the Beermen beat Magnolia in foot race and got most of their numbers from fast break. With over 7 minutes left, SMB’s lead is at 19, 90-71. Even with a big lead, San Miguel didn’t stop from sinking big baskets in all angles of the floor while giving Fajardo a well-deserved rest on the bench. The 6’10” center wrapped-up game 3 with 21 points and 17 rebounds. Coach Chito Victolero threw the towel in as he pulled out his star players and sent his third-stringers in. Likewise, Coach Leo Austria let his reserves finished the ballgame and sealed game number 3 with 111-87 lopsided win over Magnolia. Game number 4 will be on Wednesday, April 4, 2018 at 7 p.m. at the Smart Araneta Coliseum.